I'm writing this from Cleveland where I moved to take many of these same ideas out into the 'real world'. I totally agree with your and Max's statements on platforms, though you missed COMCAST! I'll take it one step further! In the future all brands have to become platforms, especially media brands. The NYTimes, NPR and the Guardian know that - Murdoch will figure it out and I expect all the major consumer facing brands - Wal-Mart, Best Buy and Target. Those that don't will all become subserviant and secondary players. I like Kevin's comment about the web being the real platform. If I had money and had to bet on what are the platforms which will emerge during the next 3 years, I would say twitter and iphone. The iphone is obvious because mobile is so huge and apple is the first to deliver the true integration between a phone and the web. Twitter because they do identity and sharing so well and so simply that they will continue to be integrated in lots and lots of applications - unless facebook connect becomes a huge hit...which I would not bet on. Yeah it is difficult to do all three very well. Sometimes something just has to give. The giants are strong though and they are figuring out how to properly compensate and make up for any losses. "...but up until last year they were pretty piss-poor at developer evangelism"
I'm actually a Developer Advocate at Google (similar to an evangelist). I'd love to hear how you think we can do a better job at advocacy and evangelization. well with 120M users, even if only 1% have provided a credit card that's >1.2M credit cards on file... however, i might be a little more generous and guess they have cc info on ~2-5% of audience. in any case, i'd be surprised if they didn't have a few million, with very good possibility of getting to larger million #'s in future via FB Connect & off-platform applications. see Jeremy Liew's analysis in September on estimated $35M annual run-rate in virtual gifts, and recent virtual gifts & micropayments article by Justin Smith at InsideFacebook where he expects Facebook to attempt intl expansion as well. I am glad you covered micro-messaging application platforms - Twitter, Identica, Yammer et al. Most analysts would have missed them. I believe that open message routing and switching has as much impact on the economy as the read/write web. @jeffrey: dammit... sorry, i'll try to swear more. in color. i think the biggest diff with FB payments might be 3rd-party access to the millions of users with cc info on file. not quite 1-click payments, but should increase conversion quite a bit. @jesse: i agree, however if you get the other 3 right, consistency matters less. in fact, i'd argue the reason people tolerated FB's selective enforcement was because the distribution opportunity was so amazing. that said, you're right they probably need to get better there. @kevin: i agree the web is the base-level platform, but you can't suggest that there aren't dramatic differences in features, users, and money available from diff companies' platforms. it may be true that several folks offer OpenSocial-compatible platforms, but there is a VAST difference in opportunity, demographics, & interest between Hi5 offering OpenSocial apps than LinkedIn... completely different environments, even though they share some platform similarities. platform technology is NOT the same as the platform, and we only need to look at # of users to prove that obvious point (not to mention security model, monetization, distribution / virality, etc, etc). your definition of OpenSocial as a platform is generally not what other people think of, and not how developers make decisions in terms of resource allocations. @patrick: you've come a long way baby. but you still have more work to do. as i've always said, the best commercial for OpenSocial is for Google to use it themselves on their largest / most important communities (YouTube, Gmail, Search). I'll be a lot more impressed once you folks eat your own dogfood there in addition to Orkut. re: platform definitions, see my comments to kevin above. sorry, "OpenSocial" isn't the platform -- its instances & implementations on a company-by-company basis are. Nice post as usual. Features, distribution, monetization, OK, I'd add tools, where Microsoft has traditionally done quite well. One point lacking in your analysis though is the difference between platforms/ecosystems and vendors. 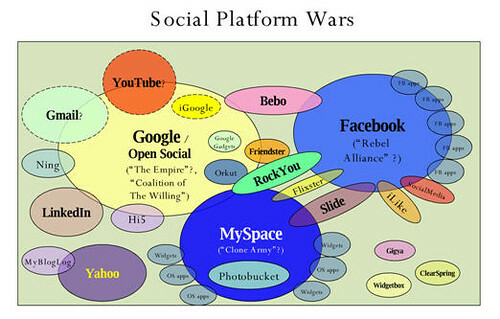 You list Orkut, Myspace, friendster etc as different platforms, which is not completely true. If you look at social networking there are 2 platforms: Opensocial and Facebook. And multiple vendors. How monetization is done will be a good test of the OpenSocial ecosystem. Dave, why are you reviewing companies rather than actual platforms? The number 1 platform is the web - no company can afford to ignore it, not Apple, not Microsoft, not Google, not Nintendo. Why are you not treating OpenSocial as a single platform? From your list SalesForce , Yahoo, LinkedIn, multiple other blogging platforms / social networks, Typepad, Blogger, Hi5, Bebo, Friendster, Orkut, other international players all support it, not to mention iGoogle. Another thing I might add is consistency. Facebook's platform started losing the interest of developers not when it dialed down its distribution mechanisms, but when it started selectively enforcing its rules and instituting top-down policy changes to curb what it considered "bad behavior." On top of that these rules were not always broadcast well, so developers often violated them without knowing it. It'd be like Congress changing the law but telling nobody, and then prosecuting you for breaking that law. Slide itself was a victim of this when Facebook took down Top Friends. An inconsistent platform, from either a technical or policy perspective, dramatically increases the risk of developing on that platform. I don't think that Facebook payments is going to change the game for them. It's not like it's impossible to pay for Facebook apps today, so an in-house payment system isn't going to address the real pain point. For a data point in how users are reacting to paid apps, see what's going on right now with Packrat. Users don't like paying for Facebook apps any more than they like paying for apps on the rest of the web. When we talk about the monetization angle with our consulting clients, we talk about keeping your business in alignment with your platform. This covers both distribution and monetization. Yahoo has never done this well (it's one of the final battles I attempted to fight just before I left there) and they still don't seem to have a plan to make it happen.